Trivia Challenge: Can You Name This Historic Site? Q: In 1869, engineers connected two railway lines in northwestern Utah, completing the world’s first transcontinental railroad. What national park site commemorates this historic event? Painstakingly reproduced locomotives meet on a historic track at the 2005 reenactment of the golden spike ceremony. Photo © Hyrum K. Wright. 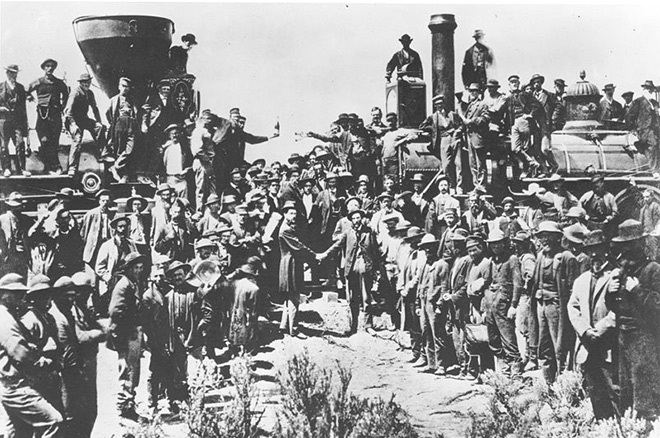 A: About 90 miles north of Salt Lake City, the Golden Spike National Historic Site captures the moment on May 10, 1869 when the Central Pacific and Union Pacific Railroads met in Promontory Summit, Utah, to celebrate one of the most impressive feats of American engineering: the first transcontinental railroad. Connecting these two lines created 1,907 miles of contiguous railway through the country’s treacherous western terrain, introducing a new era in which both people and goods could move with speed and relative comfort from coast to coast. Hundreds of miles of the original route are still in service today. This 1869 photo by Andrew Russell is the most famous representation of the original golden spike ceremony—but one important group is noticeably absent from the image. The park is named for a single railroad spike that had been specially cast for the occasion out of 17.8-karat gold. Contractors and dignitaries from California, Arizona, and Nevada actually created four spikes for the ceremony: two gold, one silver, and one iron plated with gold and silver. After several speeches, representatives from both railroads tapped the four spikes gently into a special laurelwood tie with a silver hammer—but only for show. The ceremonial tie was immediately removed and replaced with an ordinary pine tie with iron spikes. A representative from Western Union telegraphed the sound of the hammer against the last spike, so the nation could hear as a railroad worker pounded the very last piece into place. Although a famous Andrew Russell photograph captures the mood of the celebration, one essential group is missing from the picture: Chinese railroad workers. More than 12,000 Chinese laborers worked for the Central Pacific Railroad over the course of the construction, making up a majority of its workforce. These workers faced persistent discrimination, including lower compensation and stereotypes about the quality of their work, but were expected to put in grueling, often dangerous 8- to 10-hour days, six days a week. At the historic site, a natural arch near a former Chinese work camp is known as the “Chinese Arch” in recognition of these diligent and unfairly treated people, and a plaque commemorates their essential contributions to the creation of the railroad. The U.S. Department of Labor also recognized the achievements of the Chinese laborers this past May by inducting them into its Hall of Honor. 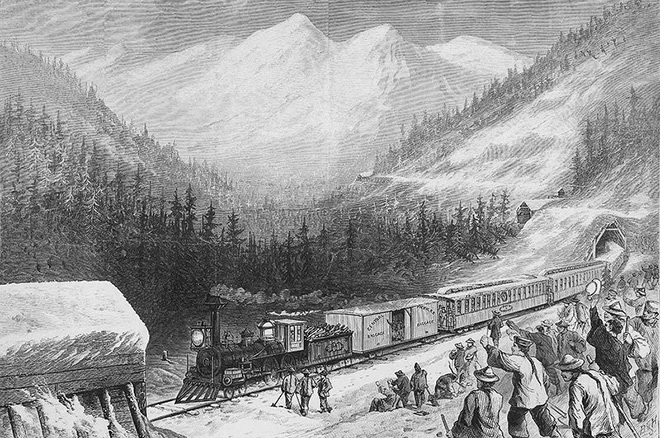 A 19th-century illustration of Chinese railroad workers in the Sierra Nevada region of California watching a train travel on the track they built. Illustration by Joseph Becker/Library of Congress. Golden Spike National Historic Site holds reenactments of the final spike-driving ceremony on Saturdays and holidays mid-May through Columbus Day, as well as demonstrations of two steam locomotives which were painstakingly reproduced to resemble the engines present at the 1869 ceremony. What you won’t see: the original golden spike, which is now part of the Cantor Arts Center collection at Stanford University in California. Learn more and plan a visit at the National Park Service website. See a remake of the historic golden spike ceremonial photo with descendants of Chinese railroad laborers.